This is a collection of the connections we've made and the interactions we've had with all kinds of beautiful people – from friends to strangers, from people we've known most of our lives to people we just met but felt a connection with – from all walks of life ... all because of a little thing called kindness. Jaime & Jill at Beautiful Nails in Brentwood, Mo. Meet this amazingly kind and sweet woman, Jill! 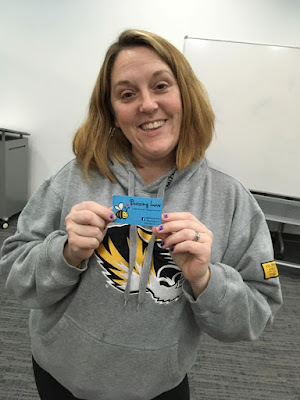 She has been a receptionist at Beautiful Nails in Brentwood (Mo.) for years — and for all of the years my family, friends and I have come and gone there, there has literally never been a time that Jill has been anything less than one of the kindest, sweetest people I have ever met! She always, always, ALWAYS has a smile on her face, treats everyone who walks through the door as if they were longtime friends and has a sweet, special way of making everyone feel better! No one leaves her without a hug and a smile ~ she is such a bright spot in everyone’s day! Thank you so much Jill for all of the love and kindness you bring to others every day! Meet Jeffery! 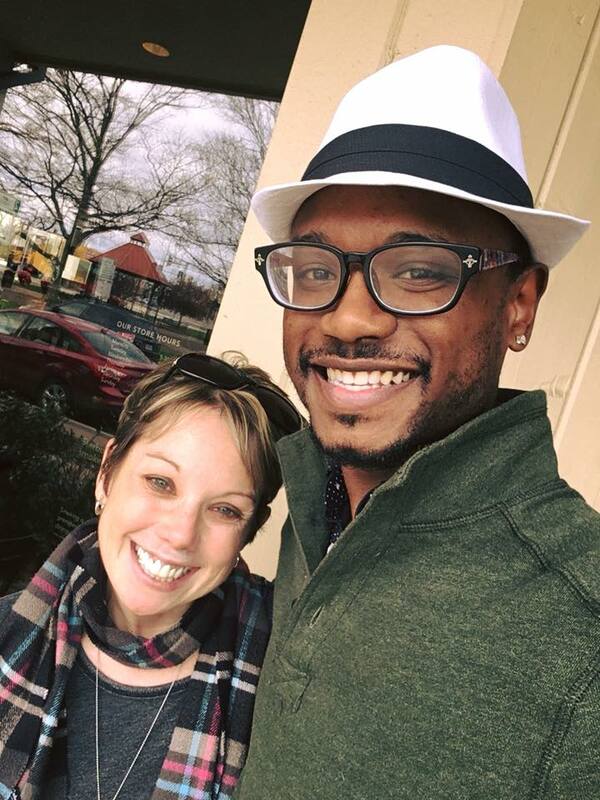 Jeffery is a barista at Starbucks, and he is all kinds of smiles and positive vibes! After seeing him on the regular since he started working at this particular Starbucks more than a year ago, I just had to call him out on his AWESOME! You get a lot more than just a cup of coffee when Jeffery’s your barista – you get his quiet way of kindness and like I said, that smile, which I’ve seen turn around some rough mornings for so many. I’ve been lucky enough to be on the receiving end of it many, many times. I just wanted to tell Jeffery how much his kindness means to others, and that his smile makes such a difference to so many of us. He also takes time to get to know people, and he cares. The whole Old Orchard Starbucks team brings the awesome for all of us! After more than a year of quick hi’s ans hello’s with Jeffery, we finally took more than a few minutes to learn just a little more about each other. Turns out his grandparents live on the very street my dad grew up on in Maplewood, which is just a few blocks from where my husband and I live now - the world is so big and yet so small, right?! Like I always say, we’re all carrying something ... but how will we know if we don’t take time to learn each other’s stories? It all starts with kindness ... and a decision try. Be kind, friends. That is all. PS. There’s a little bit of magic in these bracelets, in case you haven’t figured it out! Get yours and one to give away here! 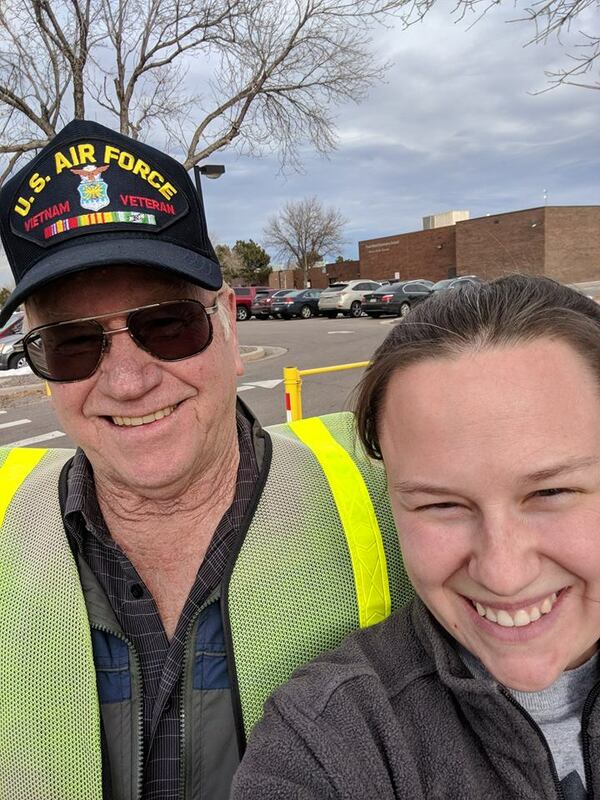 Beth & Jim at her daugher's school in Colorado! This is Jim. Jim is the crossing guard at my daughter’s preschool. He lives in the neighborhood and has grandchildren who attend the attached elementary school. Jim is a military veteran and he always, without fail, wears the veteran cap you see in the picture...even on cold days (which we have quite a few of here in Denver). Jim is a ray of sunshine in my day. And, given how I see other kids and adults interact with him, he’s a ray of sunshine for many. In fact, I have seen people who are obviously having a tough day...all frowns, walking fast so they don’t have to talk to anyone, focused on their own bubble and their own problems, whatever they may be…and then they go by Jim. Because they have to, or are at least supposed to. And I promise you, by the time they finish the walk across the crosswalk they have a smile on their face and their step, which started as tense and forced, is now relaxed. I decided that Jim needed a Buzz Band. I was very nervous. Celebrating peoples’ awesome is Jaime’s jam...but it’s not something that comes easily to me. I LOVE hearing stories of other people who have made a difference, but actually walking the walk is hard for someone who feels somewhat shy. But, I believe in Buzzing Love and what it stands for so I was determined to walk this walk. I did it. And he was so grateful! A little confused at first. But, ultimately very appreciative with his signature Jim smile. And that’s when I learned about his military service and his grandkids and his having been a part of the community for such a long time. All because I took just a few extra moments to tell someone how much they mean to me and to the community. Happy Free to Five Friday!! Meet Frank – Jaime & Travis' neighbor. Meet Frank. Frank is one of our neighbors ... for three years now we’ve exchanged countless waves and smiles and several “Hi’s” and “Hello’s” from across the street. Even when the world seems to be falling apart, I can always count on Frank for a friendly smile and a wave. There’s no good reason why we haven’t had an actual conversation until now. I’m so glad that changed the other day when Frank was outside working on his car and I was walking our pups. I stopped to say hi and Frank lifted his head from inside the hood of his truck, grabbed a rag to wipe down his hands and came over to pet the dogs. Frank paused for a second. I could see his eyes welling up just a little before he continued. I immediately just reached out and threw my arms around him in a hug. I asked him what his son’s name was – Matt. They lost Matt when he was just 14 years old. Frank’s nephew, who had been a firefighter, was killed in the line of duty when he was just 22 years old. I ached for their losses. I ached for them because I know that life-altering, unbelievable pain all too well. And Frank knew I understood it. When we moved into the neighborhood, he knew it was under the tragic circumstances of losing my dad. I asked Frank a little more about his son and loved hearing about how the two of them had such a great time together. We talked grief and its changing tides, and that while it becomes more tolerable, it doesn’t matter how long it’s been. And we also talked about the power of kindness within the pain. We talked about how you really just never know the kind of heartaches people are carrying. It was awesome to have him over for a few minutes to say hi, show him a picture of my dad, and chat with my husband and I in our kitchen before I let him get back to working on his truck on the beautiful afternoon. I thanked Frank for taking time to talk with me, and share just a little bit of his story with me – especially about his son. 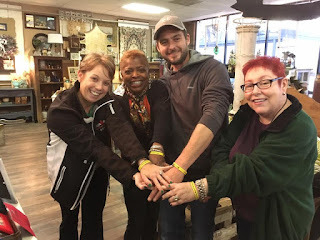 And I made sure to send him back across the street with an extra Buzzing Love bracelet in honor of Matt, and the promise that we’re now more than just neighbors. Take time to get to know the people around you. Think how many people you interact with on a regular basis, but never really get to know more than in passing ... Everyone has a story. Thank you for sharing some of yours with me, Frank. Meet this amazing mom of four, Jennifer Mayer! 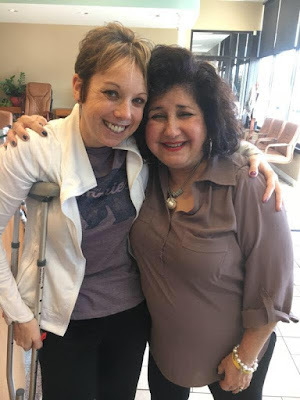 I had the pleasure of meeting her while covering a story for the newspaper I write for, and as we were talking I was just taken by her kindness, her smile and her sense of humor --- especially when I learned of the challenges she faces having a three children with special needs. She also assured me that although people can be negative and pessimistic and we're all bombarded with too much bad stuff ... that there are also so, so, so many more people like US, trying to put love into the hard parts. Thank you for doing exactly that, Jennifer!!!! You are #buzzinglove in action!!!! "My dad was killed tragically three years ago and it hurts a lot without him, but this is a kindness project we started in his honor to highlight the kindness in the world ... and you're one of those people." She smiled, I smiled and we shared a big hug ... this, this is what #buzzinglove is all about!! Thank you for putting your kindness into the world De'Che!! I've walked past people sitting outside a gas station or elsewhere asking for money more times than I care to admit ... how often do we avoid people because they don't look like us, don't talk like us or we're hesitant to interact with them for any number of reasons? Sometimes I'm good at stepping outside my comfort zone when it comes to that ... and sometimes I'm not. Today I decided to step outside that zone a little further and take a chance on someone I would have otherwise passed by. Meet Scott. 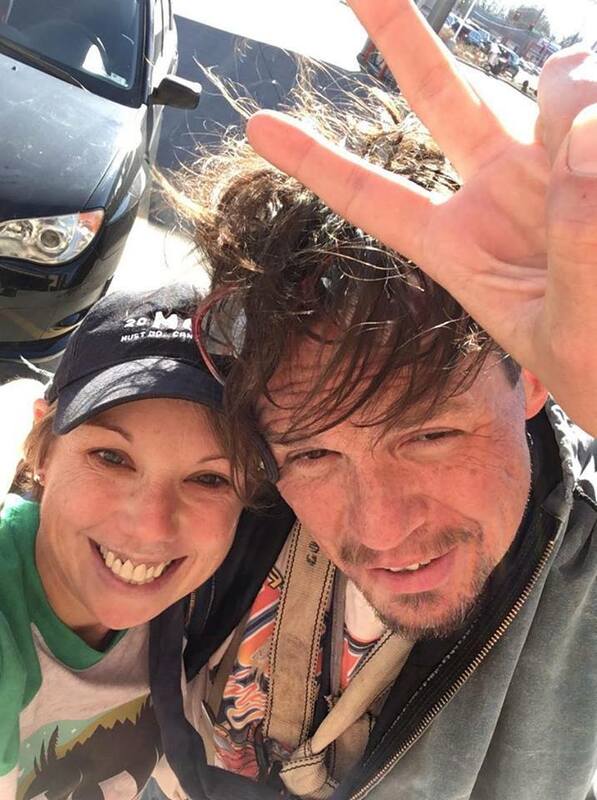 I met him outside a gas station in St. Louis. He was asking people for $3. When no one stopped, I walked up to him and struck up a conversation. I said my name was Jaime, asked him what his name was and what he needed. He said he needed $3 to get a MetroLink ticket or a bus ride to visit his grandma in Belleville. The truth is, I don't know if that was the real reason or not, but it doesn't matter. I gave him the benefit of the doubt and told him to hang on a minute while I went to get the cash in my car. 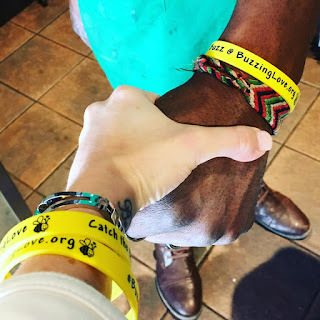 When I came back, I handed him $3 and a #buzzinglove bracelet, and told him the reason behind it. He was so touched, and thought it was just awesome. He was very grateful for the money, and offered to give me a gift card he had in exchange for it. I insisted he keep the gift card, but told him two things ... "All I want is for you to go visit your grandma, and the next time you have an opportunity to help somebody out, just pass on the kindness." So I leave you with that, my friends. PEACE AND LOVE. Peace and Buzzing Love. 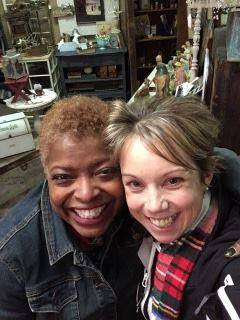 Meet Rose – this joyful, beautiful woman who I met unexpectedly last night and gave me so much love, so many hugs and so much HOPE when I stopped into the Iron Nest to hurriedly look for a few last-minute holiday gifts. The "Open" sign was still on, but when I walked in the only other customer there said, "Sorry, she's already closed." I hadn't realized it was past hours, but this kind woman behind the counter who was smiling and singing along to the fun Christmas music playing in the background immediately said, "Oh no, please, please come in and you just take however long you need, no hurry at all!" I tried to say I could come back another time, but she wouldn't have it. As I browsed around, she merrily kept singing, asked me how I broke my foot and was just so CHEERFUL. 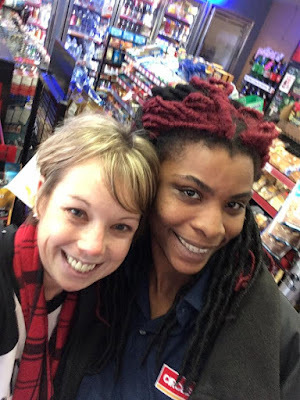 When I went to make my purchases, we kept chatting a little more and I just couldn't get over how kind and warm and generous this woman was – a true bright spot in another difficult day I was having. 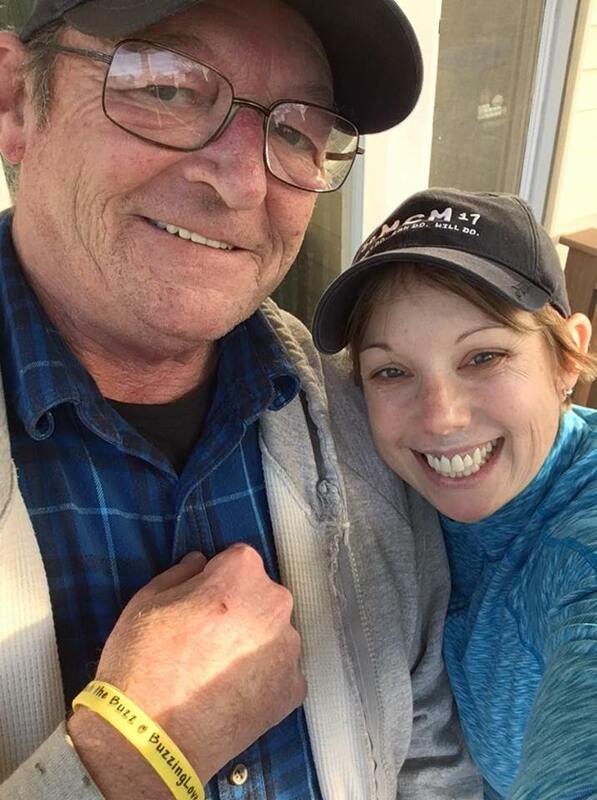 I came back with a #buzzinglove bracelet in my hand, told her about it and that this holiday season has been so, so HARD without my dad, but that her smile and her kindness had helped make my day so much better – and that the world needs more people like her. As she continued to hug me, she said: "My dad is 91 years old, and I'm going to see him tonight. When I see him, I'm going to give him a huge hug and tell him this is from Jaime because she is missing her dad right now, so I'm going to give him lots of hugs from you." I was so overwhelmed with emotion, I cried as she just hugged me and hugged me, and kept on hugging me. And she kept saying, "Don't you ever doubt that your dad is right here on this earth with you, right now. He's right here, and his love is coming right through you to me." Just ... WOW. I hugged her one last time, looked her in the eye and said, "Merry Christmas and please tell your dad hi for me and give him extra hugs." As I left and got onto my next place to go, I just kept thinking – marveled really – at the incredible connections we can have with complete strangers ... who are really not even strangers at all if we just take the time and the chance to share ourselves with each other, even for a few moments. Because it's those little moments that mean so much. I thank Rose from the bottom of my heart for her kindness, her beautiful words and the way she lifted my heart. Love ... it's what heals, what saves the world. Share it. Love and hugs, friends. Hugs and Buzzing Love. I had a GREAT time sharing smiles and a shimmer of light and life with these people - this group of seeming strangers - we all connected so ... genuinely. It. Was. Awesome!! I'm telling you - you have to step out of your comfort zone. It's more than worth it - I promise!!! Meet our newest friends, Rose, Michael and Linda!! You guys are awesome and I thank you for your kindness! I wanted to thank each and every one of you for all of your love, support and encouragement as I took on the Marine Corps Marathon on Sunday, Oct. 22, in honor of my dad, Gary A. Baranyai, who is the inspiration behind Buzzing Love. What an unbelievable, awesome and downright AMAZING experience it was!!!! Before the race even started, we were buzzing some love at the race expo! Then on race morning, the love was buzzing when a Marine who overheard my friend tell me she forgot her watch took off the one he was wearing, handed it to her and said here, "Take mine." The course and the crowds were amazing, and it was a BLUE SKIES day! It was a SEMPER FI FINISH with a personal best marathon time by more than 10 minutes! My Daddy was with every step of the way!!! The going got tough ... so very, very tough the last 8 miles, (flew through the first 18!) but no matter how much it hurt I just kept pushing, one step at a time ... imagining Daddy running right there next to me again with his SEMPER FI and NEVER GIVE UP on loop in my head. No matter how much the physical pain hurts, it's NOTHING in comparison to the pain I've had to endure without dad, so that's why I know I can always keep going, keep fighting, keep pushing, no matter what. 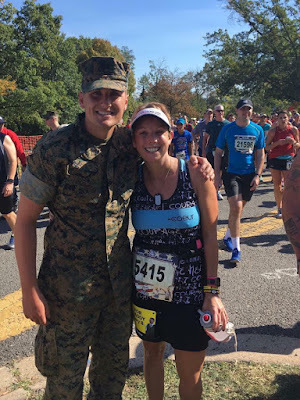 I had just crossed the finish line and apparently looked like I needed help, and an awesome Marine named Marcus took my arm and said, "Here, let me walk with you for a bit." I was crying so hard because I missed my dad so much, but he asked about dad when he saw my race bib and so I got to share a little about dad with him and he looked at me and said, "Your dad must have been a really great guy ... and ... LOOK AT THAT MUSTACHE!!!!" OMG, right?!?! So, so awesome!! He then handed me off to another Marine who put the finisher's medal around my neck ... again, what an incredible experience!! Thank you for all of your love and support!! Special thanks to my mom for her constant love and encouragement and being at the race with me, to Kris Paule Meyer for doing this thing with me and Shona Scott for the opportunity to run in her place this race. This is a day and a memory I will cherish always.